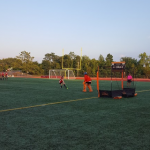 This year's Field Hockey Tournament will be held from July 19th - July 21st at Veterans Memorial Stadium (Willowbrook Park) Sprint Turf Field in New Britain. The format for the tournament is a 7 v 7 (half field) "round robin/pool play" with a minimum 3 game guarantee. The 7 players INCLUDES the goalie. Out of State Teams will be allowed to Enter in the 15&U, 18&U Club and Open Division. Please Note: 2019 High School Graduates will not be allowed to play in the 18&U Scholastic Division. 2019 High School Graduates can play in the 18&U Club division or in the OPEN Division! 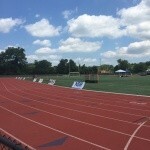 The Nutmeg State Games cooperates with the United States Olympic Committee, Connecticut Interscholastic Athletic Conference and National Collegiate Athletic Association. All athletes must abide by the rules of their association, which may include restrictions on the number of athletes from the same school, or team that enter the Nutmeg State Games. All athletes should realize that each is responsible to make certain he/she is not in violation of existing rules and regulations. All athletes must be amateurs as defined by the Nutmeg State Games and/or a National Governing Body rules for their particular sport. In addition, C.I.A.C. coaches may not coach more than One (1) team in non-school out-of-season tournaments/camps/clinics unless the total number of athletes does not exceed the aforementioned minimum on the chart provided. Prior to the first game of the tournament each team will be required to have their roster checked by the Site Director at that location. Roster checks will be done at the same time of equipment checks with the game official present. We ask each team to be at their field 15 minutes prior to the scheduled start time of their game so that we may get through rosters efficiently without delaying any of the games. Each team must have each participant playing in the tournament with the proper proof of age available. We ask that each team send in their proof of age prior to the start of the tournament. Coaches will need to have a copy of their complete roster and proof of age for all players with them for all games. Players that arrive late to the tournament must be checked off by the Site Director prior to them entering the game. If medal round games are a separate day than the first day of play roster checks will be completed prior to a team’s first medal round game. TIE-BREAKING PROCEDURE (Medal Games ONLY): In keeping with the FIH rules, the Nutmeg State Games has adopted the “Shoot Out” tie-breaking procedure. The goalkeeper/defending player starts on or behind the goal-line between the goal posts. The ball is placed on the spot designated by a “dot” (25 yds from the goal). An attacker starts area near the ball. The Umpire blows the whistle to start time; A 2nd official starts the timer; the attacker and the goalkeeper/defending player may then move in any direction. The ball goes out of play over the back-line or side-line; this includes the goalkeeper / defending player intentionally playing the ball over the back-line. The team scoring the most goals (or ahead by more goals than the other team has untaken shoot-outs available) is the winner. In the event of inclement weather, the Nutmeg State Games Administration reserves the right to modify the schedule and all tournament rules in order to safely and fairly end the tournament successfully. The officials will award a “free” water break if the weather deems it appropriate – coaching is permitted during this time. An Athletic Trainer will be on-site throughout the tournament and stationed in the medical tent at mid-field. One (1) Twenty-Five (25) minute game running time. No jewelry is permitted in this division. Tape does NOT make earrings legal! One (1) Twenty-Five (25) minute game running time – no timeouts. No overtime for preliminary round games – games will end in a tie. Overtime – If the game is tied at the end of regulation in the play-in and medal games, one series of five (5) strokes in the order presented to the officials, then sudden victory stroke off. All coaches are responsible for ensuring that all players are properly equipped. MANDATORY – ALL players in each division MUST wear mouthguards. Eyewear is optional for the Scholastic & Open Divisions. Eyewear (NFHS Field Hockey ASTM Standards only) is MANDATORY for Intermediate Division. Teams are to provide/manage their own practice balls. Game balls will be provided by the Nutmeg State Games administration. Teams will be allowed a maximum of 14 players, two coaches and one scorekeeper for credentials and awards. Any player or coach ejected from a game (red card) may not participate in the remainder of the subsequent Nutmeg Tournament games. Any player or coach receiving 2 yellow cards will be suspended from the next scheduled game. Teams will NOT be allowed to switch/move players to teams in the tournament. Rosters will be checked prior to medal round games. Open Division teams may no longer carry men on their rosters due to concerns brought forth by coaches, players, and Level 2 officials. Coaches may request a roster check prior to the start of any game. Any team discovered switching players between teams in their division- provided no mutual agreement between coaches and tournament director was obtained prior to the start of that game- will forfeit that game and be withdrawn from the tournament. Players must not intentionally raise the ball from a hit except for a shot on goal. A raised ball must be judged explicitly on whether or not it is raised intentionally. It is not a foul to raise the ball unintentionally from a hit, including a free hit, anywhere on the field unless it is deemed dangerous by the umpire. If the ball is intentionally raised over an opponent’s stick or body on the ground, even within the circle, it is permitted unless judged to be dangerous. Players are permitted to raise the ball with a flick, scoop, or sweep provided it is not dangerous. A flick, scoop, or sweep towards an opponent within 5 meters is considered dangerous. If an opponent is clearly running into the shot or into the attacker without attempting to play the ball with hrt stick, they will be penalized for dangerous play. Defensive players, not involved in corners, must lineup at the football hash marks beyond the center of the field. The ball height cannot exceed 100 ml. – the height of the ball. The Tournament Director reserves the right to make changes to the tournament rules to ensure safety and fairness. Please advise the tournament director directly if you have any questions or concerns. All teams are required to provide an official score keeper as part of their roster. We strongly recommend that the score keeper be an adult and must be present at each contest. The home team’s (which will be determined by the 1st team listed on the schedule) score keeper will be the official score keeper for that game with the visiting team also keeping score as a secondary or back up score book. The official score keeper may sit at the scorer's table or tent during the contest. The score keeper is now part of your roster and will be treated as a member of your team. Due to the fact that all competition brackets are ROUND ROBIN formats, a team may not intentionally forfeit a contest; even though the game may have no consequence on the seeding of the tournament at the conclusion of round robin play. Any team intentionally forfeiting a contest will be disqualified from further competition and the remaining teams will be re-seeded. Team organizers / managers / coaches are required to submit a Coaches Form, Team Roster, Team Sport Athlete Form (for each player on the roster), proof of age for each player on the roster and the Appropriate TEAM FEE as soon as possible to enhance their chances of competing in the Nutmeg State Games. Proof of age includes a copy (please do not send originals) of one of the following: valid driver’s license, copy of a birth certificate or a copy of a passport. Coaches - you have the option to Register Online or by Hardcopy.. You do NOT have to do both! Registration is Now Open for the 2019 "Games"
Roster (Freeze) Deadline - Friday, July 5th.